^^^ Way back in springtime, I planted some potatoes. 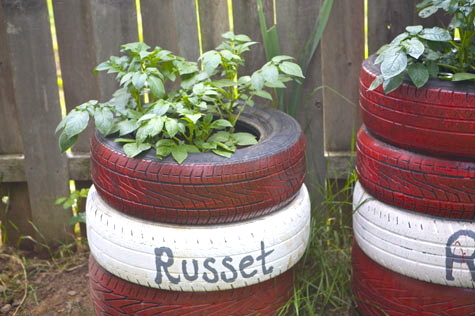 It’s a simple strategy: as the foliage grows, more tires and dirt are added to the stack. 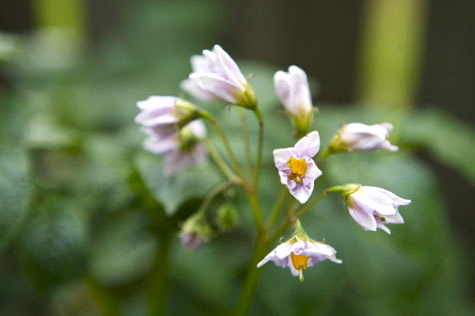 This converts stem into root and produces more potatoes, as the leaves continue clamoring skyward. This intensive small-space system is supposed to yield 25-30 pounds of potatoes. ^^^ Almost a month later, in the third week of May, the spuds had finally sprouted and were just starting to shoot up. Almost ready for the third tire . . .
^^^ In the last few weeks they’ve skyrocketed! 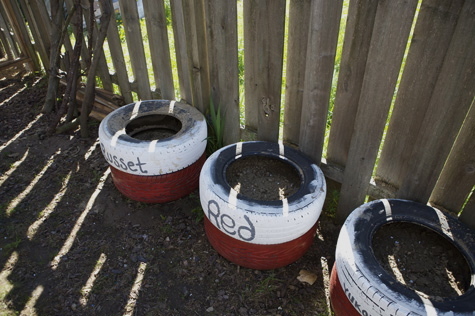 This was the start of June, after I’d added the third tire to the Yukons and the Reds. The Russets are always about a week behind. ^^^ 2 1/2 weeks into June. 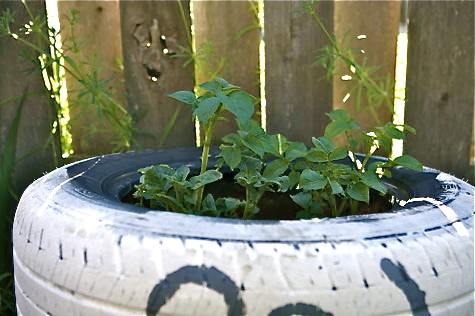 The fourth tire’s been added and the leaves are big and bushy, reaching out for more space and more sunlight. 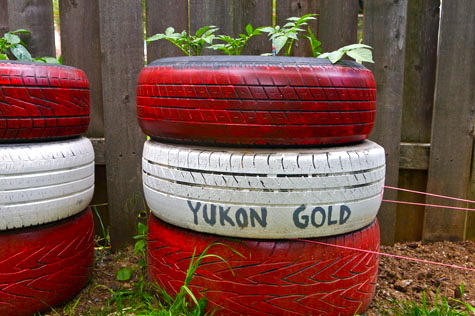 I could even add another tire on each stack, two on the Yukons. I can’t keep up! And look, the Reds are beginning to flower. Ain’t they beautiful? I can’t decide how high to go. Five tires? Six? When do I stop? ok, questions..a) where are you getting the tires, cause usually tires are expensive and would cost more than the organic potatoes…..?? Also how do you know when they are ready to be picked and how do you pick them…do you have to start planting in say like april when you did, or could you start this now? Thanks..love the pix! @ Jenny B. – I got my tires free on Craigslist. 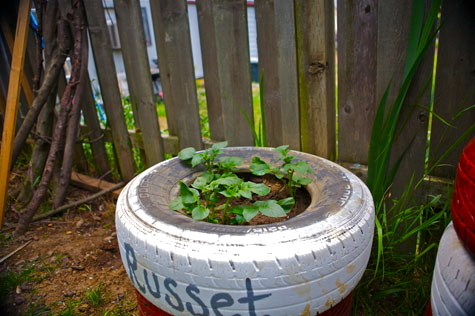 =) Have you read the original potato tire post? I go over everything in a lot more detail there. I think you could start now, if you hurry! You may get less of a yield but I think you’re still within the window of opportunity. Hmm.. That link keeps sending me right back here! @ Meghan – Fixed! Thanks for the heads up! cool, I’ll check it out, I haven’t read that one one. @ Meghan – Your balcony sounds AWESOME. A little sporadic rain won’t hurt them. I think it’s more a matter of getting them out of the ground before it’s terminally soggy. It’s rained a bunch here since I’ve planted them, and I’m not worried. I’ll just make sure they’re out by the time the real weather shows up, around Hallowe’en. 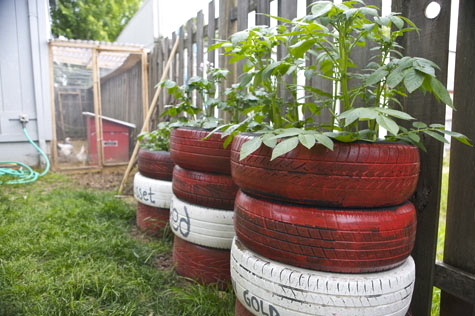 Color me skeptical, but aren’t tires made of nasty toxic chemicals and things, and over time these will leech into the ground, including the soil your potatoes are growing in? Surely the better approach would be some sort of paper/cardboard stacking tube system, rather than something which was destined for a toxic waste dump. 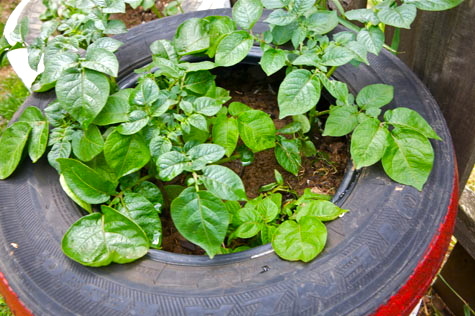 @ Virgil – I haven’t found compelling evidence to convince me that the heavy metals present in tires will manifest in the vegetables. After doing my research, I’m confident in this method, for now. I would of course encourage everyone to do your own research and follow your own intuition. I loved reading your post. I decided to try this for the first time last year and it worked better than I could have imagined! I used one tire from my husband’s lifted truck (so it’s huge) and one more car tire and left it at that. I’m thinking of doing two of these this year. Did you have a problem with the potatoes at the bottom being soft? I had to work in better drainage this year because mine were. I’m not sure how to correct this, or if it is truly a drainage problem.